Welcome to Mentor United Methodist Church! Regardless of where you are in your spiritual journey, we invite you to join us today! Our mission is to lead all onto a path of Christ-centered discipleship. Along the PATH of discipleship followers of Jesus…. SHOW God’s love by serving others. This PATH of Discipleship will result in a church that lives out Christ-like qualities and helps transform communities. Our office hours are Monday-Friday 8 am - 4pm. 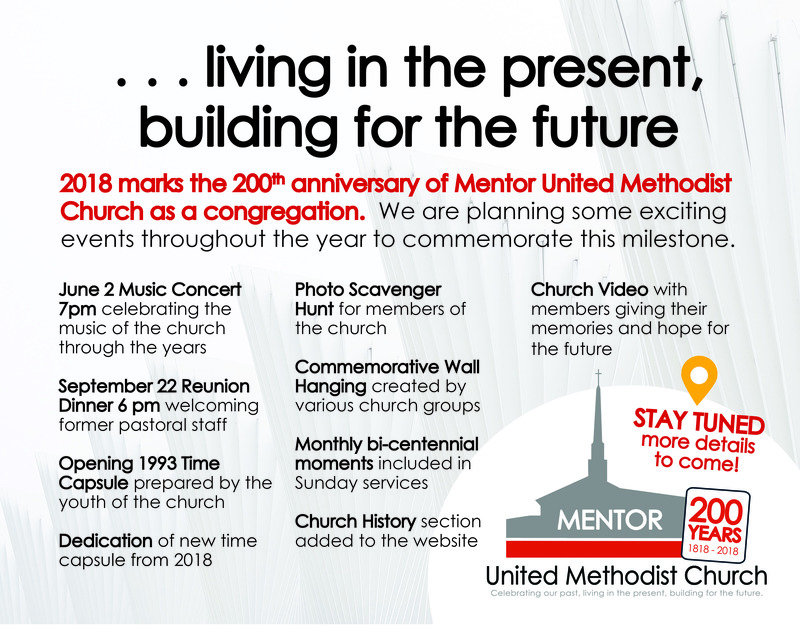 Mentor United Methodist is located at 8600 Mentor Avenue in Mentor, Ohio. Our phone number is (440) 255-3496. Need help with our app or website? Please call the office or email info@mentorumc.org and we will be happy to assist you! We offer two unique styles of worship at two times. The services run simultaneously on Sunday mornings which means there is always lots going on! Modern Worship, called iConnect, meets at 9 & 11 AM in the Fellowship hall. Traditional Worship meets at 9 & 11 AM in the Sanctuary. Funerals: We provide funeral services for both church and community members. All of our pastors work with the local funeral homes. Contact us today if you need guidance with the death of a loved one. Weddings: Our facilities and pastors are available for wedding ceremonies for both church and community members. Baptisms: Our pastors baptize both adults and infants as a outward sign of God’s work in our lives. Contact one of our pastors to learn more about baptism. Membership: Those seeking to join Mentor UMC can do so by taking our Basics Class and talking to one of our pastors. We just celebrated 200 years! Click here to learn more about the history of MUMC.